Boltwoodite: Mineral information, data and localities. For Bertram Borden Boltwood (1870-1927), radiochemist at Yale University, New Haven, Connecticut, USA. Named by Clifford Frondel and Jun Ito. 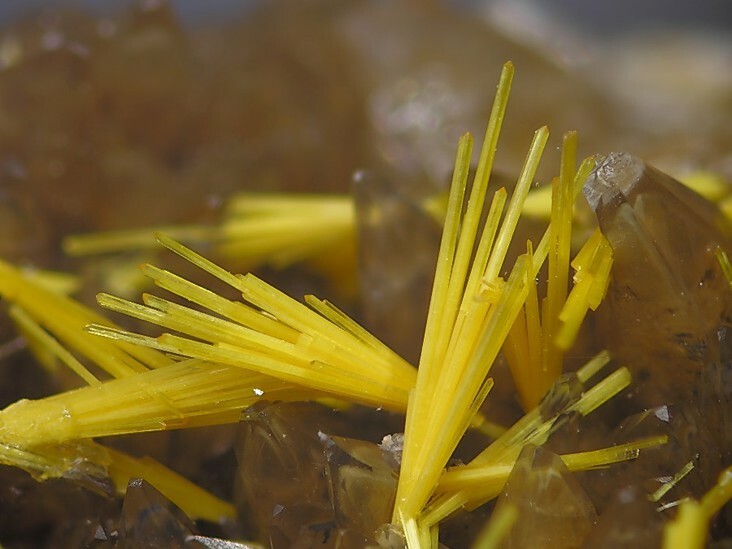 Rod-like to acicular yellow crystals in radial groups. Calcite 42 photos of Boltwoodite associated with Calcite on mindat.org. Fluorite 8 photos of Boltwoodite associated with Fluorite on mindat.org. Zippeite 5 photos of Boltwoodite associated with Zippeite on mindat.org. Brochantite 3 photos of Boltwoodite associated with Brochantite on mindat.org. Quartz 2 photos of Boltwoodite associated with Quartz on mindat.org. Uraninite 2 photos of Boltwoodite associated with Uraninite on mindat.org. Cerussite 2 photos of Boltwoodite associated with Cerussite on mindat.org. Sklodowskite 1 photo of Boltwoodite associated with Sklodowskite on mindat.org. Gypsum 1 photo of Boltwoodite associated with Gypsum on mindat.org. Goethite 1 photo of Boltwoodite associated with Goethite on mindat.org. 9.AK.05 Soddyite (UO2)2SiO4 · 2H2O Orth. 9.AK.30 Weeksite K2(UO2)2(Si5O13) · 4H2O Orth. 9.AK.30 Coutinhoite ThxBa(1-2x)(UO2)2Si5O13 · (H2O)1+y (0 < x < 0.5 and 0 < y < (2+x)) Orth. 9.AK.40 Uranosilite UO3 · 7SiO2 Orth. 14.16.1 Uranosilite UO3 · 7SiO2 Orth. 14.16.2 Coffinite U(SiO4) · nH2O Tet. 14.16.3 Soddyite (UO2)2SiO4 · 2H2O Orth. 14.16.5 Weeksite K2(UO2)2(Si5O13) · 4H2O Orth. Contains uranium - always wash hands after handling. Avoid inhaling dust when handling or breaking. Never lick or ingest. Avoid prolonged exposure in proximity of the body. Store away from inhabited areas. Stohl, F. V. & Smith, D. K. (1981): The crystal chemistry of the uranyl silicate minerals. American Mineralogist 66, 615-625. Burns, P.C. (1998) The structure of boltwoodite and implications of solid-solution towards sodium boltwoodite. Canadian Mineralogist: 36: 1069-1075. The following Boltwoodite specimens are currently listed for sale on minfind.com. Toubes, R.O., Chaar, E. y Spikermann, J.P., 1973. Minerales radiactivos de la República Argentina. 5 Congreso Geológico Argentino, 1, 249-260. Lucero, H. N., Díez, D. y Timoneri, A. (1963). Contribución al conocimiento de algunas manifestaciones uraníferas en la provincias de Córdoba, La Rioja y San Luis. Anales de las segundas Jornadas Geológicas Argentinas, Salta, Argentina. 2003, Brugger, J., Ansermet, S. & Pring, A. ' Uranium minerals from Mt Painter, Northern Flinders ranges, South Australia' Australian Journal of Mineralogy, vol. 9, n°1, pp 15-31; Brugger, J., Meisser, N., Etschmann, B., Ansermet, S., & Pring, A. (2011). 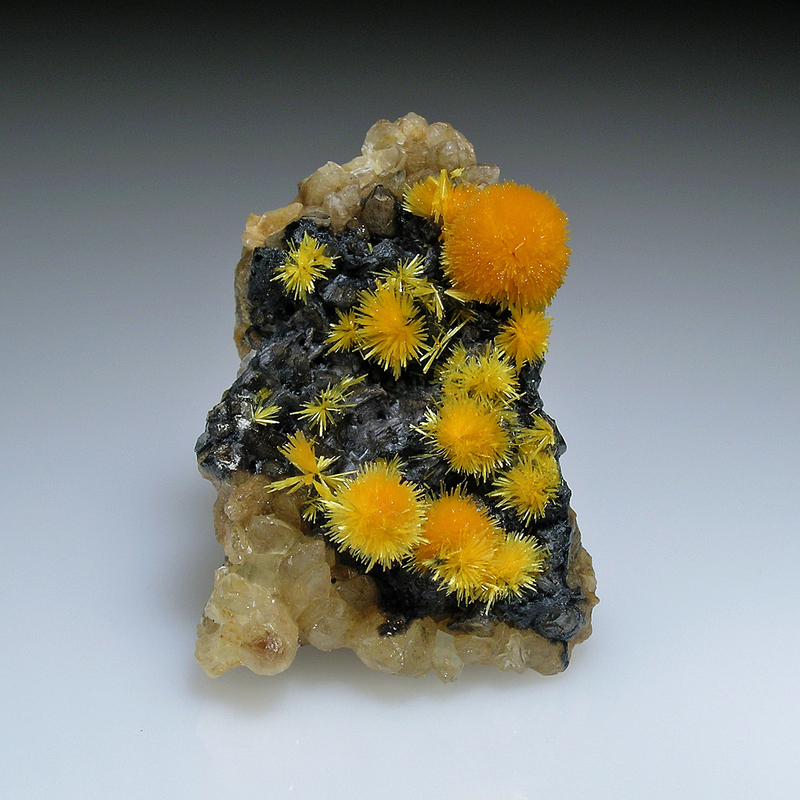 Paulscherrerite from the Number 2 Workings, Mount Painter Inlier, Northern Flinders Ranges, South Australia:“Dehydrated schoepite” is a mineral after all. American Mineralogist, 96(2-3), 229-240. 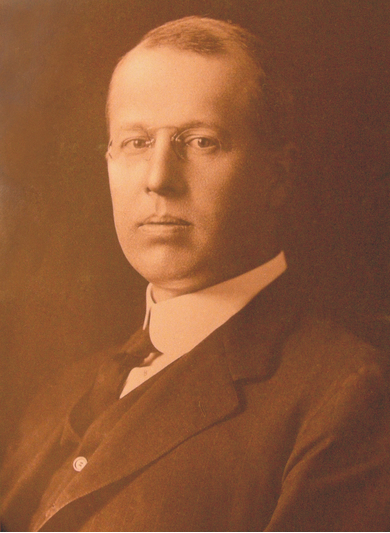 Miller A. (1980) Uranium Geology of the Eastern Baker Lake Basin, District of Keewatin, Northwest Territories; G.S.C. Bulletin 330. Watanabe (1976) Journal of the Faculty of Science, Shinshu University, 11, 53-106.
http://www.swri.org/4org/d20/ghs/PBlanca/mineral.html; Wong, V., Goodell, P. C., & Anthony, E. Y. (1999, January). Characterization of U-series disequilibria at the Pena Blanca natural analogue site, Chihuahua, Mexico. In MRS Proceedings (Vol. 556, p. 801). Cambridge University Press. Palfi, A.G., Wartha, R., Niedermayr, G. & Jahn, S. (2001) Das Boltwoodit-Vorkommen von Goanikontes in der Namib. In: Jahn, S. et al (editors): Namibia. Zauberwelt edler Steine und Kristalle. Bode Verlag. 2001, p 126-135.; Windisch, W. (2014) An introduction to micromounting. ⓘ Rössing Uranium Mine ? Polák Ľ., Ferenc Š., Mikuš T., Sejkora J. (2017): Nové údaje o uranylových mineráloch z lokality Selce pri Banskej Bystrici. Bulletin Mineralogicko-Petrologického Oddělení Národního Muzea, 25, 2, 162-169.
ⓘ South Terras Mine (Resugga & Tolgarrick Mine; Union Mine; Uranium Mine) ? Braithwaite, R.S.W. and Knight, J.R. (1990) Rare Minerals, Including Several New to Britain, in Supergene Alteration of U-Cu-As-Bi-Co Mineralisation Near Dalbeattie, South Scotland. Mineralogical Magazine, vol. 54, n° 374: 129-131.; Handbook of Mineralogy. Miller, J.M. and Taylor, K. (1966) Bull. Geol. Surv. G. B. 25, 9. [M.A. 18, 17. ]; Livingstone, A. and Macpherson, H.G. (1983) Fifth supplementary list of British minerals (Scottish). Mineralogical Magazine, vol. 47, n° 342, p. 99-105. 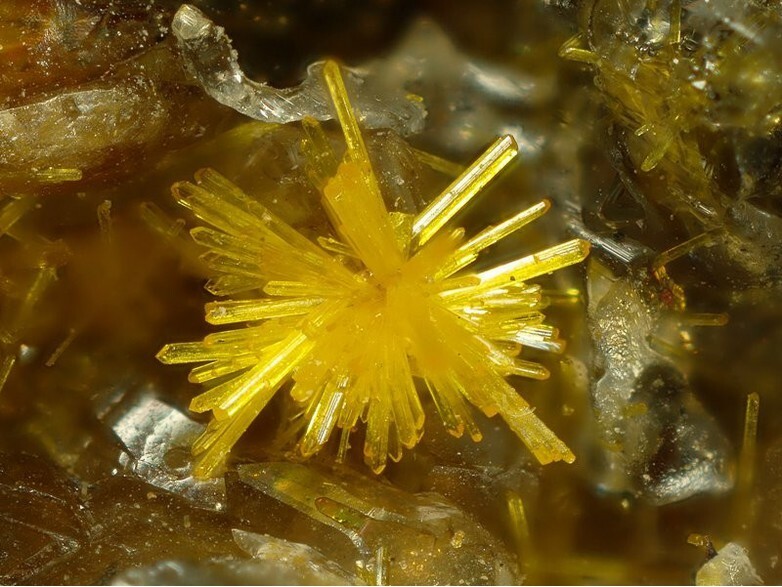 R. S. W. Braithwaite and J. R. Knight (1990) Rare Minerals, Including Several New to Britain, in Supergene Alteration of U-Cu-As-Bi-Co Mineralisation Near Dalbeattie, South Scotland. Mineralogical Magazine 54:129-131. Cuney, M., Emetz, A., Mercadier, J., Mykchaylov, V., Shunko, V., & Yuslenko, A. (2012). Uranium deposits associated with Na-metasomatism from central Ukraine: a review of some of the major deposits and genetic constraints. Ore Geology Reviews, 44, 82-106. Anthony, J.W., et al (1995), Mineralogy of Arizona, 3rd.ed. : 141.; Bollin, E. M., & Kerr, P. F. (1958). Uranium mineralization near Cameron, Arizona. In Guidebook of the Black Mesa Basin, northern Arizona: New Mexico Geological Society, 9th Field Conference Society Guidebook (Vol. 9, pp. 161-168). Anthony, J.W., et al (1995), Mineralogy of Arizona, 3rd.ed. : 141; Daphne Ross cited in Honea, R.M. (1961), New data on boltwoodite, an alkali uranyl silicate, Am.Min. : 46: 24. Anthony, J.W., et al (1995), Mineralogy of Arizona, 3rd.ed. : 181. Anthony, J.W., et al (1995), Mineralogy of Arizona, 3rd.ed. : 141; Austin, S.R. (1964), Mineralogy of the Cameron area, Coconino Co., AZ, US Atomic Energy Comm. RME 99, Tech. Inf. Serv., Oak Ridge, TN: 99. Murdoch, Joseph & Robert W. Webb (1966), Minerals of California, Centennial Volume (1866-1966): California Division Mines & Geology Bulletin 189: 108; Pemberton, H. Earl (1983), Minerals of California; Van Nostrand Reinholt Press: 517. Rocks & Minerals: 68(6): 381-393.